Privyet (Hello) from Team Russia in Chicago! We have been blessed to be in contact with our site host, Kathryn, since we started this process in April. Over the past three months we have learned a lot about Camp Iskra and have had fun planning activities for the camp sessions to come. We are all thrilled to have a chance to serve in a new environment and get to know the Russian campers over the course of the summer! Part of our preparation has included creating a team name for our American group (because what is camp without camp names?!) and we proudly introduce ourselves as Team Extreme!! We have created team shirts for ourselves and our American team members we will be meeting up with in Cherepovets. We are also VERY excited to have brought Team Extreme bracelets for every kid at camp… represent!!!! Safe travel and of course, health! Despite all of our preparation, we are still not positive what would time will look like while we are over in Russia! Keep an eye out for further posts, we will try to keep you all in the loop as much as possible! Lastly, we want to give a huge shootout to all of the UPC staff and church body who have organized such an outstanding program, shown us love and supported all the teams to get us where we are today! Another special thank you to Ryan Church and Grant Gustafson for meeting us all at the airport at THREE this morning to pray for us and send us off, you guys are awesome! Don’t let anyone look down on you because you are young, but be an example to believers in speech, in love, in life, in faith, and in purity. Only 5 more days left of camp. I can’t believe it! Camp Iskra has started to feel like our second home. We know the kids and the staff well now, so we are all very comfortable here. None of us even want to start thinking of having to say goodbye on Sunday. This last week at camp will be filled with campfires and teaching everyone how to make s’mores. Everyone is confused by the random ingredients in a s’more, but after they taste it, everyone always loves it and wants some more. Haha. Please pray that we all have the energy to finish this week strong!! Although we are trying to focus on finishing our work here at camp, we also recently found out what we will be doing in St. Petersburg, which is exciting 🙂 After a 10 hour bus ride from Cherepovets to St. Petersburg, we will begin our next part of the deputation journey. In the city, we will be working with a ministry called Harbor Ministry. This ministry takes in struggling teens and teaches them the essentials of how to live on your own, such as cooking, managing money, and taking care of yourself. Katie and I will be staying at the ministry’s apartment for the girls and Grant and Ian will stay with the guys. I’m not sure if the kids will speak English or not, but I’m sure we will get to know them and form relationships with them since we will be living with them for 10 days 🙂 Throughout the week we will be doing service projects for a church, such as cleaning and painting. I’m sure our experience in St. Petersburg will be very different from our time at Camp Iskra, but I’m excited to see what God has in store for us! We are officially halfway through our deputation experience. It is amazing how time has flown by, but it also seems to be crawling by as well. Shift #1 of Camp Iskra ended on Friday and we had to say goodbye to all our new friends. It was incredibly difficult saying bye to them because many of us formed some strong friendships. Thank goodness for facebook and email so we can all stay connected though! 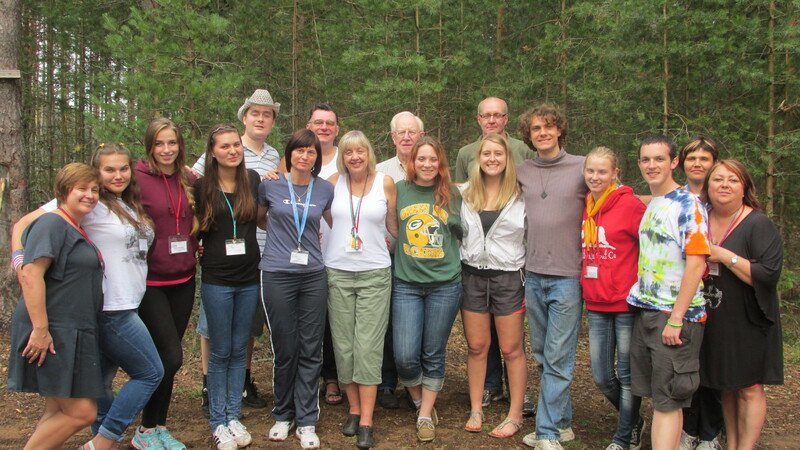 There were 3 days in between the two sessions of camp and so we had the privilege of visiting Moscow for the weekend. We boarded a train Friday night in Cherepovets and woke up Saturday morning in Moscow. We had 2 full days to explore the historical city and see another side of Russia. It was amazing how much different the pace of life was there. We were used to mellow camp life and then were all of a sudden shocked by the speed of the city. We got to ride the Russian metro (and learned the doors will shut in your face) and we also saw a lot of the city by walking. Can you guess what was first on our “list of things to do in Moscow”? Yes, it was visit the Starbucks. Being from Seattle and all, we HAD to taste the Starbucks there and see if it was up to par. Sure enough, our lattes and mochas measured up to our standards and it was nice to have a taste of home. We then got to go inside the Kremlin Armory and learn a lot about the history of Russia—it was an amazing exhibit. After a long day of walking, we got a good night’s rest and got to start off day 2 strongly. We strolled through Red Square in the morning. It wasn’t quite like UW’s red square, but it was similar Then we went through the Lenin Mausoleum and saw Lenin’s body. We will never know if it was wax or real. The rest of the day, we got to eat Russian blini (famous pancakes), stand in awe of St. Basil’s cathedral, and bargain for some souvenirs. And to finish the day, we went to Starbucks once again for some people watching. Its safe to say that we made the most of our trip, and we headed back to Cherepovets on another overnight train. What surprised us all is that we all missed camp while we were in Moscow. That was our first experience outside of camp the whole time we had been here. We were getting a bit of cabin fever and it was good to get away for a few days, but we really missed the atmosphere of camp and were thankful that God sent us to Camp Iskra. Now that we are 4 weeks into dep, most of us have hit a wall energy wise. Please pray that we have the energy to finish camp strong and give it our all! Thank you again for prayer and support! We love you and miss you! Hello everyone!! First of all, we would like to apologize for not posting to the blog earlier. Internet is not exactly the strongest in the middle of Russia so we do not have a ton of access to it. We are on day 17 and the days are starting to go by faster and faster! Since we haven’t given you any updates so far, I will catch you all up to what we have been doing here in Cherepovets, Russia. So, we are living and working at Camp Iskra, a children’s summer camp for kids ages 7-17. There’s roughly 300 kids at the camp and 100 of them are English students taking English classes at camp. That being said, there is a huge language barrier, especially with the younger kids who don’t understand that we don’t speak Russian. However, smiling and laughing is a universal language and if we are all having fun together, it doesn’t matter what language we all speak. Our team is the only team of Americans at the camp, and I honestly think the kids believe we are celebrities or something. We can’t get from one side of the camp to the other without at least a dozen “hello’s” from kids. They are all so precious. About every morning, we begin the day with English classes. All of us were paired up with an English teacher and we help out in the classroom as “native English speakers”. We mainly pronounce words the kids are learning and sometimes get to teach the lessons. We have 3 classes a day and I think it’s safe to say that we are all becoming attached to our students. This first session of camp is over this Friday and it is going to be very hard saying goodbye to all of our new friends. After classes, our team prepares for an “English Club” that we put on every day. In English club, we play crazy games, sing songs in English, and just have fun with the English students. All the kids LOVE it and as exhausting as it is, it is totally worth it because everyone has a great time. After preparing, we have lunch. Russian camp food has definitely taken some time to get used to, but I think we are all adjusting. Didn’t realize how much I’d miss American food though! The rest of our days are filled up with camp activities and spending time with all the campers. Camp Iskra is located right on the Mologa River (not sure if I spelled that correctly). Weather the past week has been absolutely beautiful so we have been swimming many times and have soaked up a lot of sun already. So Russian weather is not always cold and snowy! This whole time that we have been here, none of us have been able to wrap our heads around the fact that WE ARE IN RUSSIA. Its so weird that we are literally in the middle of nowhere in a country on the opposite side of the world. It is just funny how God picked this specific camp for us to go to. There is obviously a reason why we are here, even though the reason itself may not be obvious, but we are excited to find out what that is. Right now, our job is to love everyone around us as much as we can. God is so good and we are so thankful to have the opportunity to come here and serve for the summer. It is the 4th of July today and most of us are beginning to miss our friends and family back at home. Thank you so much for all your prayers as we have been abroad! Please continue to pray for safety, health, energy (it is needed when surrounded by children all day), and that God will guide conversations we have with others in a way that will hopefully lead towards Him. As I mentioned before, the first session of camp ends this Friday and then we have one more three-week session after that with all new campers. We will be taking a weekend trip to Moscow this weekend, which we are all very excited about! Hopefully we will post another update after we get back. We miss you all and hope everyone is enjoying their summer!